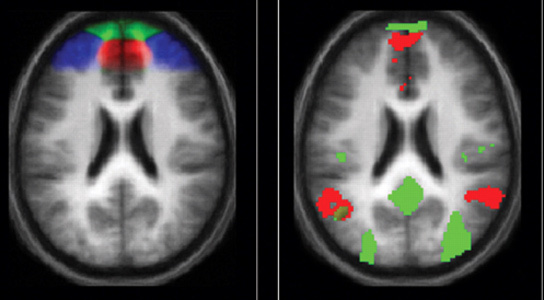 A: functional subdivision of rostral PFC according to an earlier meta-analysis of functional neuroimaging studies, B: regions of activation for contrasts related to attention, Image by Oxford University Press. A team of Japanese researchers have been working on using neuroimaging techniques to decode the dreams of people while they sleep. The researchers were led by Yukiyasu Kamitani of the ATR Computational Neuroscience Laboratory in Kyoto, Japan and they used functional neuroimaging to scan the brains of patients. I wrote this post back on the 11/11/2007. As I started using Facebook to contact my old friends, I kept wondering about what happened to Sagana. It had been years since I heard from him. I had received some news through Yan telling me that he was at some art fairs. Serendipity came knocking at my door, and I happened to meet him earlier this week while taking pictures of La Fabrique, the visual arts building of Laval University. The university building was deserted and it suited my photographic plans ideally. I snapped away. Per chance, as I was looking through my lens, I thought that I was seeing a familiar face. I zoomed in and recognized my friend Sagana. He was bearded, but that was the only change that I saw. Remarkable, after almost seven years.